What does it mean to become a “Bar” or “Bat Mitzvah” ? In other words; up to this point in the child’s development, the parent is held responsible for their child’s actions (read “misbehavior”); from this point on, the child is now held accountable. To put this in “Jewish” terms: since Mitz’vot (i.e. 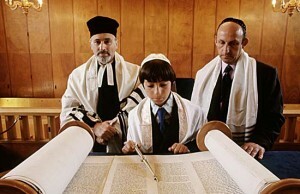 “Divine Commandments”) define the responsibilities of the individual – what their Creator obligates them to do and what their Creator forbids them to do; becoming Bar or Bat Mitzvah means that person has reached the stage in their life where they are capable of understanding and complying with these obligations. Speaking this kind of language puts in perspective the significance of each individual’s role in society. This comes to the original title of this article: “The Nature of Dignity”. I would like to suggest that every human being has an innate yearning to be significant: a raison d’être. There are very few – if any – who are satisfied being mere “cogs in a wheel”. The truth, however, is that very few of us will ever achieve the immortality of a Shakespeare or a Beethoven or a Moses, and even those individuals haven’t achieved universal significance. What chance, then, do we have? A profound discovery occurs in the life of an individual when they realize that the nature of dignity – of self-worth – lies in being of service to others. This fundamental truth, which flies in the face of natural human impulse, is suggested by the English word “knight”, which comes with the title “Sir…” The word is directly related to the German “Knecht” (Yes, “gh”was once pronounced “ch” as in the Scottish word “loch”!) which means “Servant”! In fact one of the mottos of England is “Ich Dien” which translates to “I serve”. So the question shifts to “Who or what do you serve?” To who or what do you devote your life?” The more encompassing the answer, the higher the level of self-worth or human dignity. Putting this together: becoming an adult essentially means taking on the responsibility to serve others; ones family and society. “Giving back!” Again, from the Jewish perspective, there can be no greater service that represents such “giving back” than serving the Creator of the Universe – by performing God’s commandments: mitzvot. In the process of discovering those commandments and in serving God by ones devotion to family and society, a “mere mortal” achieves universal significance!